Neil Cornrich & NC Sports, LLC: Vrabel’s leadership plays well in K.C. CLEVELAND, Ohio -- A basketball player once told me Red Auerbach built the Boston Celtics to last, "like the Roman Empire." The player was M.L. Carr, who later became Boston's general manager in the 1990s, about the time the Visigoths overran the empire. The Celtics got old together back then. Management forgot about replenishing the team with youth and speed, sentimentally letting veterans play out the string together. After that, they had no one to remember the specs of the blueprint for victory. In the old days, the Romans used career soldiers called centurions to indoctrinate the men in the ranks. 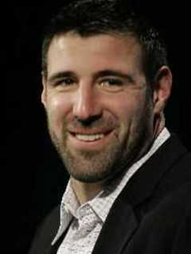 Among the new centurions in the NFL is Mike Vrabel, of Walsh Jesuit, Ohio State and the Browns' opponent this Sunday, the Kansas City Chiefs. Before New England's coaching staff made Vrabel a central element of three Super Bowl champions, he was a spare part in Pittsburgh. After New England, he and Matt Cassel, who baby-sat the quarterback position when Tom Brady was hurt last season, were traded to Kansas City for a second-round draft pick. Cassel is the player of the future; Vrabel is the veteran exemplar. “You have to lead by example. You have to let the games and the practices come to you.”The Browns have tried to do this in the past, but ex-Pat Willie McGinest, a Romeo Crennel favorite, often played as if he was 45 years old. Jeff Garcia, Butch Davis' solution to the quarterback problem, tried to tell everyone how he did it in San Francisco. "You can't come in yelling and talking 'When I was here, we did this,'" said Vrabel. "You have to lead by example. You have to let the games and the practices come to you." Vrabel didn't come into the NFL as a golden child. He was a third-rounder, the 91st pick overall. He started as a special teams crazy. Although he had to switch positions from down lineman at Ohio State to linebacker, he made himself into a Pro Bowl player. "He's a special guy," said Browns coach Eric Mangini, who coached Vrabel in New England. "You can't coach his toughness. You can't coach his instincts. [He is] a guy that wasn't highly drafted, worked his way up. Really, we had brought him in initially as a special teams player and he established himself as a really good defensive player. "Even talking to [Jason] Trusnik when he was a young guy first starting out, I talked to him about emulating a guy like Mike Vrabel whose work ethic, every day in practice [he] worked. He knew the defense, not just his assignment, knew the defense, could draw up the defense, could coach the defense." In practice, Vrabel would want to play safety. "He'd disguise stuff," said Mangini. "He used to frustrate Tom [Brady] to no end. He'd get Tom all fired up." In Kansas City, Vrabel and his three Super Bowl rings would only work if he could still play. He certainly had the pedigree. He was one of the best defensive linemen of the last 25 years at Ohio State and held the season sack record until one-year wonder Vernon Gholston broke it. He still leads the Buckeyes in career sacks. In the NFL, besides playing linebacker, he has caught nine touchdown passes over the years in the goal-line offense, plus two in Super Bowls. 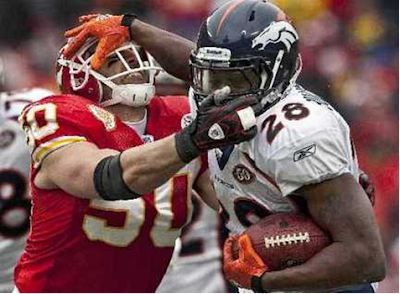 "He's one of our best defensive players, if not the best defensive player," said Chiefs coach Todd Haley. Although Richard Seymour, another exiled Patriot, criticized mastermind Bill Belichick for getting rid of too much talent as they rebuilt, Vrabel wouldn't pile on. "There's a lot of emotion when you get a phone call in late February or early March [saying you're traded]," Vrabel said. "When the dust settled, it was a good fit for everybody." Mangini sees Vrabel -- who lives in Columbus, works out with the current Buckeyes in the off-season, and says he's "as big a homer" about their Rose Bowl chances as anybody -- as a future major college coach. "He's already coaching," said Haley. The Chiefs are only 3-10. Then again, Rome wasn't built in a day.